Photograph by the talented Ann Howley. Marbling on photographs. Yep. Love it. It's ridiculously fun. I especially love the one above because of the vibrant, warm colors and how the traditional pattern Bouquet mirrors the shapes of the hot air balloons. Another beautiful photograph by the talented Ann Howley. I wanted to replicate the feel of the arctic cold, sparse landscape, and floating ice in this image so I chose to do an Italian Vein in cool colors over the top of it. I think I pulled it off since I feel a chill every time I look at it! You can learn how to create traditional patterns such as Bouquet (and 15 other traditional patterns!) in my Clouds on Water: Introduction to Paper Marbling eCourse. And if you're up for a marbling adventure, check out my Clouds on Water: Advanced Marbling Techniques eCourse where, among many things, you'll learn about additives (used to create the Italian Vein pattern) and how to marble on photographs and other non-traditional materials. For a short time, I am offering an incredible special on these two courses ~ buy the Introduction to Paper Marbling eCourse and get the Advanced Marbling Techniques eCourse for free!! That's a savings of $129!! Head on over to www.CloudsOnWater.com to register and use the discount code EBRULOVE. There are still four weeks of guided sessions by me on our very active private Facebook page and you'll have access to all the videos, website content, and downloadable handouts through the end of July! I am so excited to announce the next generation of classes available through the only online marbling classroom of its kind: Clouds on Water: A Journey into the World of Marbling. Earlier this year, in beautiful partnership with the talented and inspiring duo at Animyst, my Introduction to Paper Marbling eCourse was launched. And now I'm thrilled to rollout two new classrooms: Advanced Marbling Techniques and Marbling on Fabric. Introduction to Paper Marbling: Learn the fundamentals of marbling ~ from making the bath and your own tools to troubleshooting tips and creating traditional patterns, this course will walk you through every step of the marbling process and take you on the journey to producing beautiful creations on paper. Advanced Marbling Techniques: For those with marbling experience, start diving in deeper and go beyond the basics, breaking rules along the way and taking your marbling adventure to the next level. Advanced patterns, using additives, marbling on non-traditional materials and 3D objects are just some of the topics covered. Registration is now open for the January 18 - March 6, 2016 session (six-week guided course). All of the content will be available for six months (July 2016). The cost depends on which class you take, however every course includes downloadable handouts, six-weeks of guided instruction, and access to the written and video content for six months. The Introduction to Paper Marbling eCourse investment is normally $259 but through December 31, 2015, we are offering an EARLY BIRD special of $179 ~ that's a savings of $80! 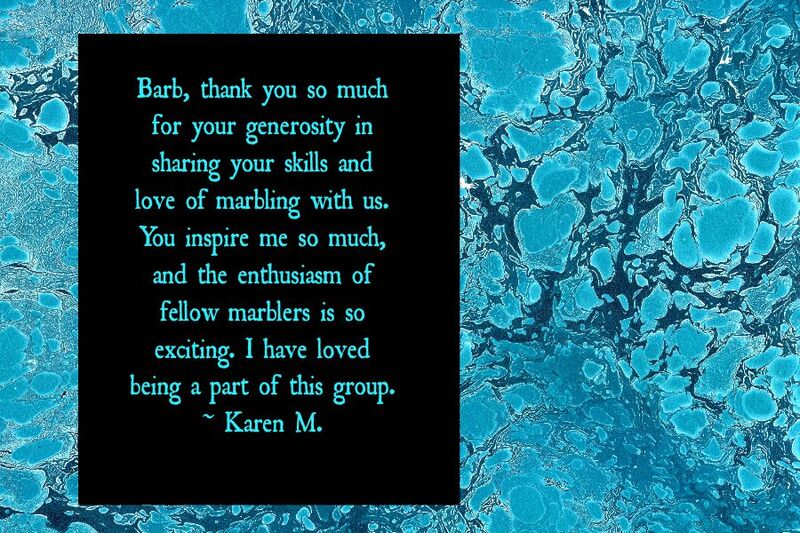 The Advanced Marbling Techniques eCourse investment is normally $129 but through December 31, 2015, we are offering an EARLY BIRD special of $79 ~ that's a savings of $50! The Marbling on Fabric eCourse investment is normally $139 but through December 31, 2015, we are offering an EARLY BIRD special of $110 ~ that's a savings of $29! get access to all material for ONE FULL YEAR! to all the videos and other content. The six-week guided portion of my Clouds on Water eCourse just wrapped up and I cannot even begin to express what an amazing experience it was for me and for participants. They wowed me with their tenacity, creativity, and enthusiasm and I was blown away by how quickly they embraced the art form 100% ~ in all its challenges and glory! While the guided group portion of Clouds on Water is over, the classroom itself is still open! This introduction to paper marbling eCourse was designed to be taken at your own pace so you can jump in and get started marbling at any time. And now I'm offering two new options for Clouds on Water: on-your-own or with mentoring! You’ll have access to all the videos, written content, and website through December and lifetime access to the private Facebook page (where lots and lots of great troubleshooting conversations are happening and inspiring pictures of people’s work are being posted). All of the above PLUS you will have access to me for four weeks (2x/week) of personal one-on-one mentoring via email (or 20-minute Google chats (2x/week), where and when possible, if agreeable arrangements can be made). Send Barb as many questions as you’d like, as many images as you like, as many comments and thoughts and ideas…and you’ll have your own private lessons as you work your way through the course. The fee includes downloadable handouts and access to the written and video content through December, 31 2015, and unlimited access to our private group Facebook page. You will learn the Turkish form of marbling called Ebru. Translated, Ebru means “cloud.” And that is exactly what paint on the water bath looks like: clouds on water! You will be guided through every step of the paper marbling process to help you create a successful experience at home, from building your confidence with marbling techniques to learning how to deal with hiccups along the way. Setting up your marbling space. Preparing the water bath and mordant. Exploring traditional patterns and variations on those patterns. For more about the Clouds on Water eCourse, head on over to the website: www.CloudsOnWater.com. In Ebru, this is a traditional pattern called Zebra. It could almost pass as another traditional pattern called Antique. The difference between the two is the size of the Stones thrown on top of the Gelgit. Larger stones make it Zebra. Smaller stones make it Antique. I teach the history and variations of traditional patterns to my students because I feel when on knows the past ~ when one understands how something got to where it is ~ only then can one bring the story to life. I'd love to story tell with you. New in-studio classes have just been announced and registration is still open for the Clouds on Water eCourse. It's Happening! Clouds on Water Classroom Opens! The statistics are pretty impressive, if I do say so myself. Clouds on Water officially starts today. The classroom is robust and a visual stunner...and I couldn't be happier with the way everything came together. My goal was to provide a learning environment rich with content delivered in a variety of ways to meet everyone's learning styles ~ just as I do when I'm teaching students in my studio. eCourses can be tricky. I've seen some bad ones. And I've seen really good ones. The difference is huge. When Jen and Michelle of Animyst first planted the seed about a marbling eCourse, I have to admit, I was a bit skeptical. Marbling is not a stagnant art form. There are so many moving parts. Most people aren't even aware of the art form let alone have the basic tools to get started. Where would I begin? Clouds on Water truly is a journey into the world of marbling. Step by step, we make our way through this stunning art form that is as mesmerizing to look at as it is to create. And I am honored to walk alongside the brave, beautiful people (from around the world!) who are taking the course right now. Their enthusiasm even before the classroom opened buoyed me as I worked on the final touches. Clouds on Water is for them. And for others who dare to venture into new creative territory that will profoundly change them. Once again, I welcome you to the magic. It was an Overmarble kind of day last week! The Overmarble is one of my favorite marbling techniques. I can't wait for participants in my intro-to-marbling eCourse Clouds on Water to dive in and try it. We'd love to have you join us too! Class starts June 8. Visit www.CloudsOnWater.com for details. Gratitude Giveaway: Win a Spot in Clouds on Water eCourse! Marbling’s beginning centuries ago was rooted in secrecy. Initially, its practice was limited to royalty and religious figureheads in Japan. As it became a trade in the Middle East and Europe, master marblers were reluctant to share techniques and formulas in order to protect their source of income. Fast forward to today, when the cloak of secrecy surrounding the art form could not be more transparent. Today’s marblers are incredibly generous with their knowledge. And I mean incredibly generous. I am very lucky to humbly stand in a circle of artists who have peeled back the layers of marbling, who have taken the hits and the challenges and worked through them, whose curiosity and willingness to explore have raised the art form’s bar…and then shared with me all that they know. This is especially true of three very important teachers on my marbling path ~ Tom Leech, Pat K. Thomas, and Elin Noble ~ as well as the extraordinary talent found in the Yahoo Marbling Group. Had it not been for all of them, I may have given up on marbling altogether when my first paint didn’t float. But I didn’t. And marbling changed my life. In honor of these wonderful folks, I am giving away 5 spots in my Clouds on Water intro-to-marbling eCourse which starts on June 8. To enter, simply leave a comment below letting me know who you are and why you would love to learn how to marble. Feel free to also nominate someone who has had a significant impact on your life, who has been as generous with their wisdom and sage advice as my community has ~ a teacher, mentor, friend, advisor, family member, neighbor ~ and they will be eligible to win too! I will announce the winners on June 4. May Day through Mother’s Day Special! Two great days of celebration deserve two great offers for the Clouds on Water intro-to-marbling eCourse! 1) Register with a friend and get full access to the class for $159 each! That’s $100 off the regular price ($259) when two or more people sign up together. Just go to the registration page, sign yourself up using the promo code MAYLOVE (don't forget to hit "apply"), and let us know the name of the person (or names!) you’re signing up with. Then have your friend(s) register and do the same! 2) Early Bird registration is extended as well ~ $179 when signing up on your own. That’s an $80 savings! Clouds on Water is a great gift to give yourself (yes, you deserve it!) and someone special (gift certificates available!). Or buddy up with someone and go on the marbling journey together! Clouds on Water is a six-week guided introduction-to-marbling-on-paper eCourse with six-months access to all videos and written content, lots of downloadable handouts, and a lifetime of endless possibilities and fun! These specials end May 10! Go to www.CloudsOnWater.com for more information and to register. In my Introduction to Paper Marbling eCourse, I emphasize purpose over perfection because, well, perfection is not possible in marbling. And when you let go of expectations, that’s when the good stuff happens. I teach the overmarble technique in my class because it opens up endless possibilities to add texture, movement, and depth to a piece…and it also can cover up the boo-boos that no one else sees but is driving us up the wall. Yeah, I get it. I’ve been there. So let’s strive for purpose together while at the same time have fun playing with our boo-boos. Early bird registration for Clouds on Water ends soon. Register by Thursday, April 30 and save $80. In beautiful partnership with the talented and inspiring duo at Animyst, I am beyond excited to announce my latest offering: an online, introduction to marbling eCourse called Clouds on Water: A Journey into the World of Marbling! So many of you have asked for this ~ learning to marble from the comfort of your own home, at your own pace, and in your own space. No travel, no schedule...just you, the tank, and the MAGIC of marbling. And I will be with you for the first six weeks of the course, leading conversations and answering all of your questions via a private Facebook group. I'll also post additional Studio Session videos as needed by student discussions. Registration is now open for the June 8 – July 17, 2015 session (six-week guided course). All of the content will be available to you for six months (December 2015). The regular fee is $259 but for those who sign up by April 30, you will get the early bird price of $179! That's an $80 savings! The price includes downloadable handouts and 6-months of access to all the written and video content. Learn more about the class on the Clouds on Water information and registration page.